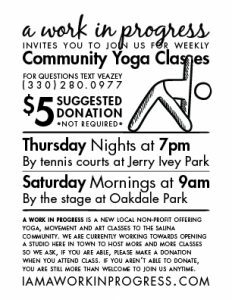 Come to Oakdale park Saturday mornings or Jerry Ivey Park Thursday nights for a yoga flow with Veazey. ALL levels welcome, even first-timers, just let Veazey know it’s your first time and she’ll give you some tips on what to expect. Each week the practice will be different. Vinyasa yoga is usually the base of these yoga classes but some Kundalini or Yin yoga may very well be incorporated into the mix.